In 2017-18, QTC contributed significant, positive financial results for the State and its public sector entities through the delivery of debt funding and management, cash management, financial advisory, and specialist public finance education services. Its continued focus on delivering whole-of-State outcomes by providing advice and initiatives that enable clients to make better business decisions and improve revenue has been integral to this success. The official copy of the Annual Report, as tabled in the Legislative Assembly of Queensland, can be accessed from the Queensland Parliament tabled papers website database. The Queensland Treasury Corporation Annual Report 2017-18 provides details of Queensland Treasury Corporation’s (QTC’s) achievements, outlook, performance and financial position for the 2017-18 financial year. I am pleased to present the Annual Report 2017–18 and financial statements for Queensland Treasury Corporation. the detailed requirements set out in the Annual Report requirements for Queensland Government agencies. A checklist outlining the annual reporting requirements can be found at page 58 of this Annual Report or accessed at www.qtc.com.au. Queensland Treasury Corporation (QTC) has a statutory responsibility to advance the financial position of the State, and a mandate to manage and minimise financial risk in the public sector and provide value-adding financial solutions to its public sector clients. Established under the Queensland Treasury Corporation Act 1988, QTC is a corporation sole, reporting through the Under Treasurer to the Treasurer and the Queensland Parliament. We build strong partnerships with our clients to deliver simple and well-designed solutions that achieve quality outcomes for Queensland. We work as one team, taking joint responsibility for achieving our vision and collaborating to achieve outstanding performance. We aim for excellence using flexible and agile processes to continuously improve. We show respect by recognising contributions, welcoming ideas, acting with honesty, being inclusive and embracing diversity. We inspire trust and confidence in our colleagues, clients, stakeholders and investors by upholding strong professional and ethical standards. As the Queensland Government’s central financing authority, Queensland Treasury Corporation plays a pivotal role in securing the State’s financial success. QTC assists the State’s public sector entities to make the best use of their surplus cash balances within a conservative risk management framework. It offers overnight and fixed-term facilities and a managed cash fund. QTC offers a range of education and training courses through its partnership with the University of Queensland, that complements its products and advisory services and allows it to share its specialist financial, commercial, treasury management and risk management expertise with clients. Courses are developed and delivered by experienced professionals and industry experts. In 2017-18, Queensland Treasury Corporation (QTC) delivered significant whole-of-State and client benefits, funded the State’s $7 billion borrowing program and realised an operating profit of $94 million from its capital market operations. Ongoing investor demand for QTC’s AUD benchmark bonds supported the successful execution of the $7 billion 2017-18 borrowing program. While global economic conditions have continued to improve, political and geopolitical tensions have contributed to increased market volatility in the operating environment. Queensland has benefited from stronger commodity prices, which has enabled the Government to reduce its debt without impacting frontline services or targeted infrastructure spending. The State’s borrowing requirements for new money are forecast to remain modest over the next two financial years, before increasing to support large-scale infrastructure projects. Strong returns and benchmark outperformance of QTC’s Capital Guaranteed Cash Fund, which remains one of the largest managed funds in Australia with $8.3 billion under management. In 2017-18, QTC recorded an operating profit after tax from its capital markets operations of $94 million (2016-17: $129 million), mainly attributable to earnings on capital, plus fair value accounting gains associated with the management of QTC’s funding task and balance sheet. Separate from QTC’s capital markets operations, QTC’s long-term assets, which comprises the investments set aside primarily to support the State’s defined benefit superannuation, recorded an after tax operating loss of $194 million (2016-17: $224 million profit). These long term assets were transferred to QTC by the Queensland Government under an administrative arrangement in 2008; in return, QTC issued fixed-rate notes to the State that provide a fixed rate of return. The operating loss represents the difference between the return received net of fees ($1.9 billion) on the assets managed by QIC, and the return ($2.1 billion) provided by QTC under the Fixed Rate Note agreement with Treasury. While QTC bears the fluctuations in the value and returns on the asset portfolio, there is no cash flow effect for QTC. Any losses incurred by this segment have no impact on QTC’s capital markets activities or its ability to meet its obligations. In the year under review, both Standard & Poor’s and Moody’s Investors Service reaffirmed Queensland’s and QTC’s credit ratings. QTC is rated AA+/A-1+/Stable and Aa1/P-1/Stable by Standard & Poor’s and Moody’s Investor Services respectively. These stable ratings are a key reason for continued demand from domestic and global investors for QTC debt. working with local governments to implement asset management improvement projects, complete strategic financial reviews, and develop a high-level diagnostic tool to assess councils’ financial and infrastructure health. QTC also helped enhance financial capability across the public sector through its education partnership with the University of Queensland. Over the year, more than 1,200 participants completed financial education courses; these courses achieved an average evaluation rating of nine out of 10. With its ongoing focus on organisational excellence, QTC continues to provide its employees with both the opportunity and the environment to prioritise their activities to maximise the delivery of real value to the State. During the year, a number of system and process improvements have been implemented, improving accuracy, efficiency and security. Risk management has remained an active priority, with ongoing commitment to QTC’s enterprise-wide risk management framework. Employee engagement is tracking well, with 2018 survey results showing overall employee engagement at 74% (financial services benchmark is 62%), which is aligned to the top 10% of responses when compared to survey participants from more than 50 financial services organisations globally. Queensland Treasury department representative on the QTC Capital Markets Board, Warwick Agnew, resigned from the Board on 25 May 2018 following his appointment as Director-General of the Department of Local Government, Racing and Multicultural Affairs. Stephen Roberts resigned from the Board on 1 June 2018. Both Mr Agnew and Mr Roberts made a significant contribution to QTC’s success during their respective tenures and, on behalf of the Board, we thank them for their dedication and contribution. QTC’s achievements in the 2017-18 financial year have demonstrated significant performance outcomes against each of its three strategic goals — to deliver value to the State and its clients; to ensure access to sustainable funding; and to achieve organisational excellence — and provided measurable increases in organisational capability and efficiency. With QTC’s expert leadership team and talented employees, we are confident QTC will be able to contribute a significant, meaningful and tangible benefit to help secure the State’s financial success in 2018-19 financial year and beyond. In 2017-18, QTC contributed significant, positive financial results for the State and its public sector entities through the delivery of debt funding and management, cash management, and financial advisory services. Underpinning this success has been a continued focus on delivering whole-of-State outcomes by providing advice and identifying initiatives that enable clients to make better business decisions. developing financial forecasting models to improve business outcomes for the departments of Justice and Attorney General, and Health and Education. QTC’s advisory assignments range in scope, complexity and monetary value and contribute to creating the best outcomes for Queensland. Building on the work completed in the 2016-17 financial year in partnership with Queensland Treasury, QTC facilitated a centralisation of cash holdings. This is aligned to the Government’s Debt Action Plan, providing a net accounting interest benefit of $29 million. Land restoration: Assisted the Department of Environment and Queensland Treasury in establishing the Land Restoration Fund, including structural and funding advice, green bond funding and creation and monetisation of carbon credits. development of a High Level Diagnostic tool to assess councils’ financial and infrastructure health in a condensed timeframe. undertaking numerous regional site visits, in order to better understand regional economic opportunities and gain insights into the unique challenges of each region. QTC continued to build on the success of its inaugural Green Bond issue by becoming a programmatic issuer. QTC also increased the size of its Climate Bonds Initiative (CBI) eligible asset pool to $4.6 billion through the verification of additional low carbon electrified transport assets. QTC continued to provide low-cost loans and high-performing investment facilities throughout 2017-18. QTC has continued to successfully deliver its core mandate of providing clients with a lower cost of funds by capturing the significant economies of scale and scope in the issuance, management and administration of the State’s debt. QTC offers cash management products that enable its clients to maximise the value of their surplus funds. In 2017-18, QTC’s Capital Guaranteed Cash Fund provided strong returns and outperformed its benchmark, the Bloomberg AusBond Bank Bill Index, by 73 basis points. The Cash Fund continues to offer flexibility by providing clients with same-day liquidity as required. At the end of the 2017-18 financial year it remained one of the largest managed funds in Australia with $8.3 billion under management. In 2017-18, QTC upgraded QTC Link – QTC’s industry-standard online transaction platform, and transitioned 100 per cent of eligible clients to transacting online. Through the partnership with the University of Queensland (UQ), QTC provided finance education courses to more than 1,200 participants. These courses were provided as a mixture of workshops, masterclasses and webinars. Average post-course evaluation rating was nine out of 10. The program is on budget under the sharing arrangement with UQ. In 2017-18, QTC raised $7 billion of term debt to meet its clients’ annual funding requirements and refinance debt maturities. QTC also undertook an additional $3.5 billion pre-funding, reducing future borrowing programs. During the year, QTC issued a new 2030 benchmark bond and 2022 floating rate note to further smooth and extend its maturity profile and diversify its investor base. QTC continued to demonstrate its reputation as a premium issuer with its investors, through the high-quality execution of term debt issuance. Using the strength of its AA+ credit rating, QTC provided the market with diverse, liquid lines that resulted in $10.5 billion being successfully raised for the Queensland Government’s current and future borrowing and refinancing requirements. The original estimated term debt requirement for 2017-18 was $6.8 billion. This was revised up to $7 billion following the Government’s Mid-Year Fiscal and Economic Review, released in December 2017.
issuing $475 million into the 2047 bond, increasing this line to $505 million. 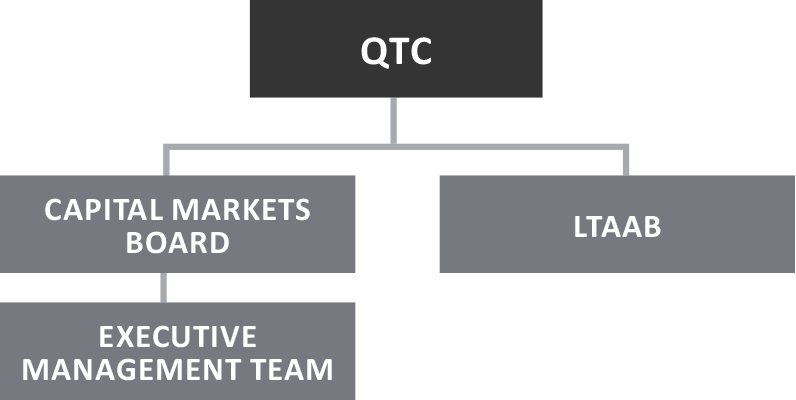 QTC maintained its focus on providing its Fixed Income Distribution Group and investor base with flexibility and transparency. On 13 June 2018, QTC announced its indicative $8 billion term debt borrowing requirement for the 2018-19 fiscal year. QTC’s proactive management of the borrowing program and the management of its client funding and balance sheet activities helped to smooth and extend its maturity profile and support QTC’s bond spreads. Management of QTC’s liquid assets, funding execution and balance sheet asset and liability management provided significant savings during 2017-18, while QTC’s total debt outstanding as at 30 June 2018 was approximately $89 billion. QTC’s issuance strategy continues to support its commitment to a diverse range of funding sources to complement its core A$ benchmark bonds. This diversity has seen it utilise a variety of instruments in the past year, including bond maturities out to 30 years and a new floating rate note. Investor demand remained solid for QTC’s primary issuance, with all public issuances oversubscribed. In 2017-18, QTC proactively managed its bond maturity profile to reduce refinancing risk by achieving more even maturities across the curve. This included reducing late 2018 and 2019 maturities by $1.6 billion to reduce refinancing risk, improve credit metrics and smooth and extend the maturity profile. The issuance of $1.75 billion in a new 2030 benchmark bond and increasing the 2047 non-benchmark bond by $475 million also contributed to smoothing and extending QTC’s maturity profile. In May 2018, QTC released its first Green Bond Report which detailed the allocation of proceeds from its inaugural issuance. It also announced that QTC has become a programmatic issuer of Climate Bonds Initiative (CBI) certified green bonds, an increase to its eligible project pool to more than AUD4 billion and enhancements to its green bond approach. These developments increase the scope and ability for future green bond issuance to support the State Government’s focus on transitioning to a low-carbon economy. QTC continued to focus on activities to expand its investor base, delivering an effective domestic and global investor relationship program during the year. Open and transparent communication with the market remains a focus. QTC continued to regularly engage with both its Fixed Income Distribution Group and investors through its funding and markets team. QTC has a diverse range of funding facilities in a variety of markets and currencies. The majority of QTC’s funding is sourced through long-term debt facilities, with QTC’s AUD benchmark bonds being the principal source of funding. QTC is committed to maintaining high organisational standards to provide an environment where corporate goals can be achieved and organisational risks are actively monitored and addressed. QTC’s continued focus on organisational excellence has ensured the ongoing realisation of benefits and optimised the foundation from which its core funding and advisory business is delivered. These benefits are providing employees with both the opportunity and the environment to prioritise their activities to maximise the delivery of real value to the State. Measurable improvements have been made in the operational accuracy and efficiency of the production of client statements, implementation of enhanced system functionality, and reduction in reconciliation completion times and the need for employees to work outside business hours. Access to secure information has been streamlined, providing a more efficient working environment, as well as improved client communication and project analytics. QTC manages its risks within an enterprise-wide risk management framework. The framework supports the achievement of QTC’s corporate objectives by providing assurance that QTC’s risks are identified, assessed and adequately and appropriately managed. QTC produces a risk appetite statement that sets the tone from the top for risk management and establishes clear boundaries in which QTC’s material risks should be managed. The framework identifies key internal controls, and through periodic attestation by control owners, assurance is given to management and the Board that these controls are operating effectively. The outcome of the 2017-18 internal audit program was positive with 12 internal audits conducted and completed successfully. Throughout 2017–18, QTC managed its portfolio market risk exposures, including interest rate, foreign exchange and counterparty risk, within its Board-approved risk management framework. QTC continues to hold a portfolio of diverse, liquid financial securities to meet the State’s liquidity requirements, consistent with its internal and external policies. QTC competes with the global financial industry to attract and retain its high calibre employees. Pursuant to the Queensland Treasury Corporation Act 1988, QTC employees are hired on individual contracts, with employment practices aligned to the financial markets in which it operates. QTC’s Board regularly reviews QTC’s remuneration framework, which comprises fixed and variable remuneration. The reviews are benchmarked against remuneration data from the Financial Institutions Remuneration Group (FIRG) which provides salary survey data for the Australian finance industry. QTC’s variable remuneration framework provides an opportunity for an annual short-term incentive for eligible employees, designed to ensure market competitiveness and reward outstanding organisational, group and individual performance. The QTC Board approves the entitlement to, and the quantum of, the annual review of fixed remuneration and variable short-term incentives. Enterprise and team-based development programs have been delivered with a focus on culture and team development. An employee engagement survey conducted in early 2018 resulted in an employee engagement result of 74 per cent, which places QTC at around the 90th percentile of the benchmark data. The engagement survey metric on leadership capability demonstrated that QTC’s leaders are at the 99th percentile of the benchmark data, reflecting the success of our programs in enabling leadership growth. activities to celebrate our cultural diversity and the 26 nationalities represented in QTC’s workforce. QTC’s policies support flexible working, where flexibility will contribute to QTC achieving its corporate objectives. Flexible working arrangements in place during the reporting period included part-time work, job share, purchased annual leave, phased retirement and flexible hours of work. QTC has a corporate health and wellbeing program (Fit 4 Work), that provides activities to promote physical and mental wellbeing. Activities for the 2017-18 financial year have included flu vaccinations, health assessments, skin checks, corporate games, healthy eating seminars, and mental health and resilience sessions. QTC regularly reviews and updates its policies and procedures to comply with legislative changes and reflect best practice, and to ensure employees have access to avenues through which to raise concerns, including an internal grievance process. QTC and the Capital Markets Board have agreed the terms and administrative arrangements for the exercise of the powers that have been delegated to the Board by the Under Treasurer as QTC’s corporate sole. overseeing executive management development and succession planning. The Board typically holds monthly meetings (except in January, April and November) and may, whenever necessary, hold additional meetings. The Board comprises members who are appointed by the Governor-in-Council, pursuant to section 10(2) of the QTC Act, with consideration given to each Board member’s qualifications, experience, skills, strategic ability and commitment to contribute to QTC’s performance and achievement of its corporate objectives. QTC’s Board is entirely constituted of non-executive directors. The Board has established three committees, each with its own charter, to assist it in overseeing and governing various QTC activities. the adequacy and effectiveness of audit activities. During the year, the Accounts and Audit Committee recommended the adoption of annual financial statements, reviewed external and internal audit reports and the progress in implementing the recommendations from those reports, and reviewed the Queensland Audit Office’s Client Service Plan and QTC’s Internal Audit Plan. QTC’s Accounts and Audit Committee has observed the terms of its charter and had due regard to the Audit Committee Guidelines. strategies to positively influence QTC’s high performance culture and risk management processes. In addition, the Committee oversees the adequacy and effectiveness of risk management (including residual risks) relating to people and culture. The Human Resources Committee must have at least three members and meet at least three times a year. The Human Resources Committee has observed its charter. the effectiveness of management of QTC’s funding and market activities within the policy framework and alignment with QTC’s risk appetite. operational risk of QTC’s funding and market activities. The Committee must have at least three members and meet at least four times a year. The Funding and Markets Committee has observed its charter. ^ Mr Roberts resigned from the Board on 1 June 2018. * Mr Agnew resigned from the Board on 25 May 2018. Board members are appointed by the Governor-in-Council, pursuant to section 10(2) of the Queensland Treasury Corporation Act 1988 on the recommendation of the Treasurer and in consultation with the Under Treasurer. Members are chosen on their ability and commitment to contribute to QTC’s performance and achievement of its stated objectives. Gerard Bradley was the Under Treasurer and Under Secretary of the Queensland Treasury Department from 1998 to 2012, prior to his appointment as the Chair of QTC’s Board. He was also a QTC Board member from 2000-2007. Mr Bradley has extensive experience in public sector finance gained in both the Queensland and South Australian treasury departments. He was Under Treasurer of the South Australian Department of Treasury and Finance from 1996 to 1998, and of Queensland’s Treasury Department from 1995 to 1996. Mr Bradley held various positions in Queensland Treasury from 1976 to 1995, with responsibility for the preparation and management of the State Budget and the fiscal and economic development of Queensland. Warwick Agnew was Queensland Treasury’s Deputy Under Treasurer, Agency Performance and Investment, previously holding the positions of Deputy Under Treasurer, Commercial Advisory and prior the department’s Chief Operating Officer. Throughout his career, Mr Agnew has held senior leadership positions across both public and private sector organisations including roles with Queensland Treasury and Trade, Queensland Treasury Corporation and ASX-listed entities, Macquarie Capital and Transfield Services. Mr Agnew resigned from the Board on 25 May 2018. Tonianne Dwyer is a lawyer by profession, with a career of more than 25 years in international investment banking and finance in both executive management and board positions. Ms Dwyer’s executive experience covered a broad range of sectors, including real estate investment and development, financial services, health and aged care, education, research and development, and media. She held senior roles with Hambros Bank Limited, Societe Generale and Quintain Estates & Development PLC including a role with the finance division of the UK Department of Health. Over her executive career she had experience in the UK, Europe and Wall Street. Ms Dwyer currently holds directorships with Metcash Limited, DEXUS Property Group, DEXUS Wholesale Property Fund, ALS Limited and Oz Minerals Limited. She is also a Senator and Deputy Chancellor of the University of Queensland and a Director of Chief Executive Women Limited. Anne Parkin has more than 25 years’ of international management and board level experience across Asia-Pacific banking and financial services. Ms Parkin is Chairman of Eco Fuels Innovations and previously, was a Non-Executive Director of both Credit Suisse Securities in Malaysia and the Philippines. As an Executive Director, she was a member of the Hong Kong Control Committee responsible for oversight of operational risk for Credit Suisse Hong Kong and its affiliates, while as Operations Executive, she was accountable for operational matters with local regulators including the Hong Kong Monetary Authority and Hong Kong Securities & Futures Commission. In recognition of her expertise in the Asia-Pacific, Ms Parkin was invited to participate in the Asia Securities Industry & Financial Markets Association (ASIFMA). Stephen Roberts has extensive investment banking, leadership and governance expertise, developed across his career in the global financial markets. He is the former Chief Executive and Chief Country Officer of Citigroup Australia, where he was responsible for the Citi franchise in Australia and New Zealand. Prior to that, Mr Roberts was the Managing Director, Institutional Business, Citigroup Australia, and held senior roles with Salomon Brothers/Citigroup Hong Kong, Lehman Brothers in Hong Kong, Salomon Brothers in London, Melbourne, Sydney and New York. Mr Roberts resigned from the Board on 1 June 2018. Karen Smith-Pomeroy is an experienced financial services senior executive with a specialty in risk and governance. Ms Smith-Pomeroy held senior executive roles with Suncorp Group Limited from 1997 to 2014, including Chief Risk Officer Suncorp Bank from 2009 to 2013, and Executive Director, Suncorp Group subsidiary entities from 2009 to 2014. She has also held positions on a number of Boards including CS Energy Limited and Tarong Energy Corporation Limited. Ms Smith-Pomeroy is a Non-Executive Director of National Affordable Housing Consortium Limited, Stanwell Corporation Limited, InFocus Wealth Management Limited and Kina Securities Limited. She is a Queensland Advisory Board member of Australian Super and is also an Independent Audit Committee member of the Queensland Department of Local Government, Racing and Multicultural Affairs and South Bank Corporation. Jim Stening has more than 30 years’ experience in financial markets in the fixed income asset class, including hands-on trading and investing in Australian and global capital markets. Mr Stening has extensive experience in debt markets, business development, executive management and corporate governance across a diverse range of economic cycles. He has held senior roles at NAB, Merrill Lynch and Banco Santander. Mr Stening is the founder and Managing Director of FIIG Securities Limited, Australia’s largest specialist fixed-income firm and a Non-Executive Director of related companies, Chairman of Ozfish Unlimited Limited, and a Fellow of the Australian Institute of Company Directors. The Long Term Asset Advisory Board (LTAAB) is responsible for managing the reserves set aside for future government liabilities (such as superannuation and insurance). The LTAAB holds meetings at least four times per year and held four meetings in the year under review. The LTAAB members are appointed by the Governor-in-Council, pursuant to section 10(2) of the QTC Act. The LTAAB has observed its charter. In the year under review, EY completed its internal audits in accordance with the approved annual audit plan. The foregoing general purpose financial statements have been prepared in accordance with the Financial Accountability Act 2009 and other prescribed requirements. The Directors draw attention to note 2(a) to the financial statements, which includes a statement of compliance with International Financial Reporting Standards. (ii) the foregoing annual financial statements have been drawn up so as to present a true and fair view of Queensland Treasury Corporation’s assets and liabilities, financial position and financial performance for the year ended 30 June 2018. The financial statements are authorised for issue on the date of signing this certificate which is signed in accordance with a resolution of the Capital Markets Board. During the year, QTC continued to enhance its electronic document management system for improved information management and storage cost reduction. QTC employees are required to comply with QTC’s Code of Conduct for employees, which aligns with the ethics principles and values in the Public Sector Ethics Act 1994 (Qld), as well as the Code of Conduct established by the Australian Financial Markets Association of which QTC is a member. Both codes are available to employees via QTC’s intranet. A copy of QTC’s Code of Conduct can be inspected by contacting QTC’s Human Resources Group (see Appendix E for contact details). Appropriate education and training about the Code of Conduct has been provided to QTC staff. The total remuneration payments made to the members of the QTC Capital Market Board was $331,330 and the total on-costs (including travel, accommodation, and hiring of motor vehicles for the members) was $29,897. No payments in relation to remuneration or on-costs (including travel, accommodation, and hiring of motor vehicles for the members) were made to members of the Long Term Asset Advisory Board in the year ending 30 June 2018. The related entities in Note 23 are not equity accounted in the financial report of the Queensland Treasury Corporation. These entities are consolidated into Queensland Treasury’s financial report. Basis point: One hundredth of one per cent (0.01 per cent). Credit rating: Measures a borrower’s creditworthiness and provides an international framework for comparing the credit quality of issuers and rated debt securities. Rating agencies allocate three kinds of ratings: issuer credit ratings, long-term debt and short-term debt. Issuer credit ratings are among the most widely watched. They measure the creditworthiness of the borrower including its capacity and willingness to meet financial obligations. QTC has a strong rating from two rating agencies—Standard & Poor’s, and Moody’s. Fixed Income Distribution Group: A group of financial intermediaries who market and make prices in QTC’s debt instruments. Floating rate notes (FRNs): A debt instrument which pays a variable rate of interest (coupon) at specified dates over the term of the debt, as well as repaying the principal of the maturity date. The floating rate is usually a money market reference rate, such as BBSW, plus a fixed margin. Typically the interest is paid quarterly or monthly. Green Bond: QTC Green Bonds are guaranteed by the Queensland State Government, issued under the AUD Bond Program with 144A capability and certified by the Climate Bonds Initiative. Proceeds from QTC Green Bonds are to be used to fund qualifying green projects and assets for the State of Queensland. The proceeds are allocated to specific projects that support Queensland’s transition to a low-carbon and climate resilient economy. The qualifying green projects and QTC’s Green Bond Framework have been certified by the Climate Bonds Initiative and verified by DNV GL, an approved third-party assurance provider. Note: This checklist excludes reference to any requirements that do not apply to QTC for the current reporting period. Queensland Treasury Corporation’s annual reports (ISSN 1837-1256 print; ISSN 1837-1264 online) are available on QTC’s website at www.qtc.com.au/about-qtc/annual-reports. If you would like a copy of a report posted to you, please call QTC’s reception on +61 7 3842 4600. QTC is committed to providing accessible services to Queensland residents from culturally and linguistically diverse backgrounds. If you have difficulty understanding this report, please contact QTC’s reception on +61 7 3842 4600 and we will arrange for an interpreter to assist you. QTC also offers investors the ability to subscribe to quarterly funding updates. QTC’s annual reports (ISSN 1837-1256) are available on QTC’s website for the past five financial years, earlier years are available by request. Printed copies can also be provided; please contact us for further information.